Samford University’s School of the Arts is presenting a retrospective of professor emeritus Eric Olson’s work in the Samford Art Gallery Jan. 22 – Feb. 21. The gallery talk is Feb. 1 from 4-5:30 p.m. when Olson will share his perspective on the role of the scenic designer and the art of communicating through the design process. The breadth of work is extraordinary, encompassing productions from Samford as well as local, national and international theaters. During his career, Olson created scenic and or lighting designs for more than 400 productions. The exhibit includes intricate models, elevations, sketches, photos and actual scene pieces from a large body of work. In this exhibition he shares work from The Ballad of a Sad Café (1987), Hansel and Gretel (2012 and 2017), The Sea Gull (2001), The Madwoman of Chaillot (1985), Man of La Mancha (1995), Joseph and the Amazing Technicolor Dreamcoat (1999), Much Ado About Nothing (2003), City Stages (1993-1999), This is American (1996-1999), To Be Young, Gifted and Black(1980), The Trip to the Bountiful (2013), The Rover (2008), Translations (1998), A Midsummer Night’s Dream (1976 and 2016), The Trojan Woman (1990) and Sister Angelica (1980). Olson created backdrops for local music festivals and for productions at nearby Six Flags over Georgia in Atlanta. 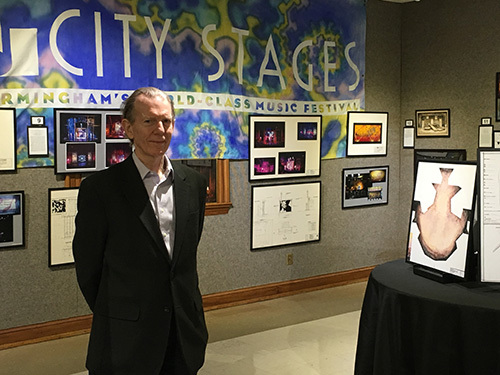 During his Samford tenure from 1974-2016, he designed sets for operas and theatre productions spanning 42 years. A pivotal moment in his career was joining the United Scenic Artists in NYC in 1992 which required an extensive exam but opened doors to many opportunities including productions with London’s National Theatre. Olson says that there are several elements that he really enjoyed about scenic design including the collaborative nature of the process and seeing the designs come to life on the stage. “Theatre is an interesting art form. It is so much bigger than any one person,” says Olson. Kristin Kenning, director of Samford Opera, worked closely with Olson on Hansel and Gretel last December and echoes his knack for collaboration. The Samford Art Gallery is open to the public Monday – Friday, from 9 a.m. – 4 p.m. and is in Swearingen Hall.